One of the reasons Sarah and I set out on our adventure was to find a community that we felt inspired by and that would challenge us in ways we didn’t expect. Another big reason , though, was that we wanted to create something together and be able to share it with everyone. We were tired of serving someone else’s goals and visions and wanted to start digging into something of our own making. To that end, we are blogging our journey, documenting it through photos, and eventually want to harness that to build a community art space. We wanted to start our own business centered around our art – writing for Sarah, and visual art for me – that would also support and enrich the community we lived in. Having worked in retail for 15 years I have an inkling of how to run a business and Sarah’s experience in the nonprofit sector and community development background would act as a compass. Otherwise, though, we’re working with a blank slate. When we started planning our trip, we looked for the community art centers on our route and angled to talk to anyone and everyone who would chat with us. So far, we’ve visited three that stand-out spots: TwispWorks in Twisp, WA, Gallery One in Ellensberg, WA and Mighty Tieton in Tieton, WA. The first place we visited was at TwispWorks in Twisp, Washington. 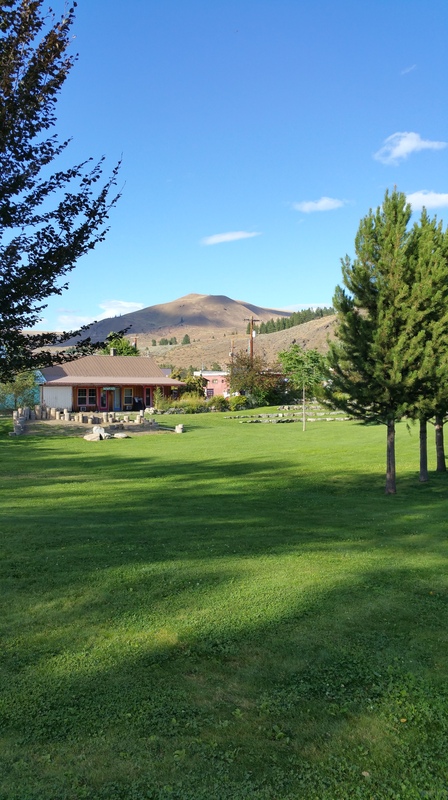 We found this cool campus when we were camping in the Methow Valley near Twisp a few years ago. There didn’t seem to be anyone around at the time, but we also hadn’t conceptualized this plan when we were there. How They Did It: TwispWorks came about when the U.S. Forest Service announced that they were going to auction off their now defunct Twisp District campus in 2007. The buildings had been vacant since 1994 when the USFS consolidated in Winthrop Washington, 30 miles up the road. What happened next was a result of the community coming together to find a way to use the empty space in a way the would benefit Twisp in a similar way that the forest service did. The community conducted a feasibility study to determine if they could in fact use the space in some way, so they formed the Twisp Public Development Authority to acquire, redevelop, restore and manage the property. But it wasn’t until an anonymous $1M donation to actually buy the property did the ball really start rolling. Partners were secured and started moving in, then the ownership switched from the PDA to TwispWorks. Currently they have 29 partners. The cool thing about TwispWorks now is that they have so many great things going on, but because of the size of the campus, they still have tons of space available. Finished space is available, but for the most part artisans work with TwispWorks on retrofitting and rehabing one of the open warehouse spaces. This is great because you get to decide how you want it built and what amenities will best suit your studio’s needs. TwispWorks will also work with you on your lease terms if you want to pay and/or do some of the work yourself. After all, they benefit from having you there (and having you take care of some of the cost) as well as you benefit from having your own space to suit your own needs – it’s a real symbiotic relationship. I really like how TwispWorks feels like a campus (because, really, it is) and how easy it is to walk over and talk to your neighbors or host an art walk or even just a fun party right in the middle of it all. For us, communities like Twisp feel a bit small and far from civilization. Not to mention being able to find an old and unused Forest Service type campus seems a bit few and far between as well as coming up with the money, or finding someone willing to donate the money, to then purchase said property. I really like the feel of TwispWorks, but I’m not sure we would be able to find something as unique as their situation even if I think we could find a community willing to try and support something as awesome as that. 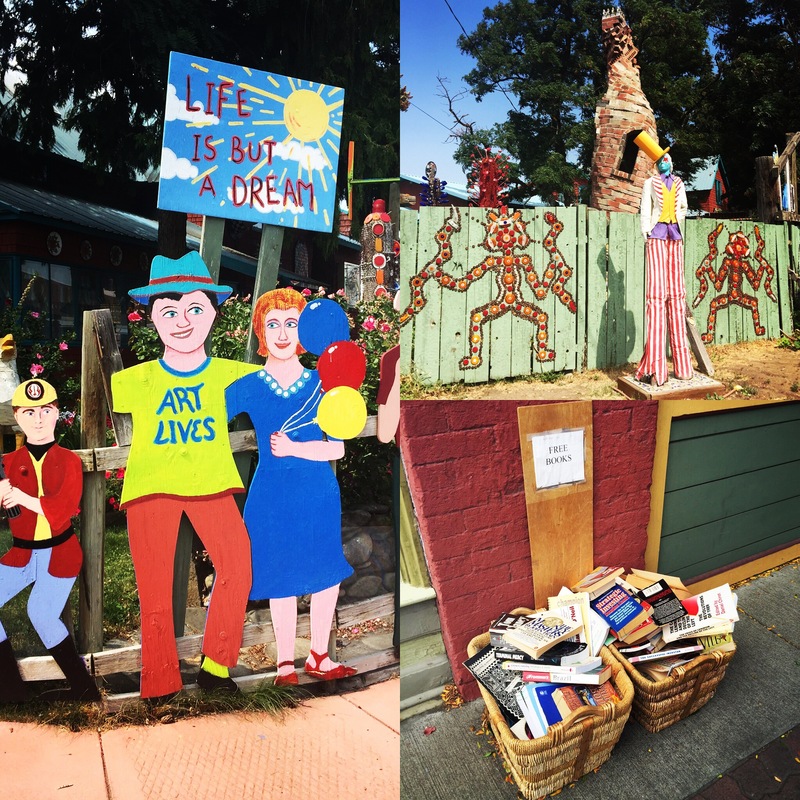 Public art and free books. Not bad, Ellensberg. The next place we visited was, by all accounts, a complete accident. As we headed south from British Columbia we contemplated our route through Washington and Oregon and decided that we would head south through the center of both states. We decided to stop in Ellensburg, Washington for lunch. We had heard Ellensburg was a pretty cute place but neither one of us had ever actually driven through. When we drove in we went immediately to the downtown and parked. It was cute and very western themed – they are still a prime spot for rodeos FYI. We walked the dog around a bit and settled into eat some sandwiches on a sidewalk patio. Across the street we saw a pretty decent looking gallery and after we ate decided to go check it out. How They Did It: Gallery One Visual Arts Center was pretty amazing. Not always under the name Gallery One, the idea and the art have been around since 1967. Started by a women’s group in town who wanted to have an art show, they set up shop and really enjoyed what they were doing and the idea formedan art gallery. 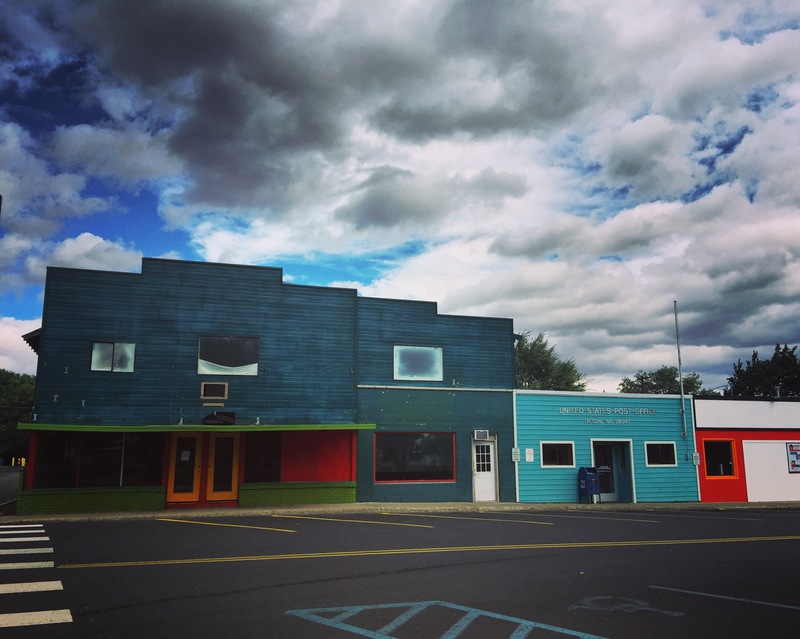 The gallery opened in 1968 as the Ellensburg Community Arts Gallery. Later it moved to an upstairs location in 1972 and in 1994 they changed their name to the current Gallery One Visual Arts Center. Then in 1997 the gallery was fortunate and was able to purchase the building they were in. They renovated the space and were able to expand to the whole building including a Gallery, Gift/Retail Space, full kitchen, back patio, art studios and classrooms. And it is kickass. What I liked a lot about Gallery One was that they offer quarterly classes, an art after school program, a full ceramics studio available for rent and classes, studio spaces for artists and facility rentals for the community. It is so welcoming–they are friendly, inclusive and open to anyone (including passers by with four legged companions). They were chatty and willing to share their experiences. All of this in a really cool old building in the heart of downtown. This is really close to what Sarah and I had talked about initially. We talked about starting small and then working our way up to a bigger space, more facilities and more event space. There was nothing to dislike about Gallery one and what they are doing. The only daunting thing in this time of instant gratification would be the waiting to add and expand services. Otherwise I really feel like we found a great model to follow in our future pursuit of arts advocacy. Ellensburg, very near Yakima, called Mighty Tieton (pronounced BTW Tie-eh-ton). They told us that the main difference between Mighty Tieton and their operations was that it was a for profit organization. So, we had to go and see what the differences were. How They Did It: Mighty Tieton started with a guy on a biking trip who ended up biking through the town of Tieton, Washington, popped both tires on his bike and had to stop and change them. When he looked around he saw a lot of potential in all of the unused buildings. He went back to the city and told a bunch of his friends and professional colleagues who went and visited Tieton and also agreed – much could be done here. Their “consensus was that Tieton could become an incubator for artisan businesses.” In the last eight years Mighty Tieton has bought and refurbished many buildings including two warehouses, a church and a storefront. So far they have just shy of 12 businesses that they have helped start in Tieton including a fine press and book bindery, letterpress and screen printing studio, a goat cheese creamery and farm, a cidery, a laser cutting shop, a kite production facility, book and merchandise warehousing and fulfillment, and several artist’s studios and workshops; plus many more. We tried multiple times to get a tour of their facilities. When we initially contacted them they told us that they were super busy and that they wouldn’t really be able to do anything for us on our way through. However, they told us that if we were nearby at the end of August, things would be quieting down and they would be happy to give us a tour then. So we decided that we would try and stop by on our way back through Washington. When we finally nailed down when we would be going through we got back in contact with Mighty Tieton to set up a tour. We were told that they had another group that was going to tour at 10am on our requested day and that we were welcome to join. It meant a super early morning and a long drive for us, but we figured we would try and make it. Four hours on the road and it became clear that we’d missed the window. What we did get to see, however, were the two exhibits being held in their warehouse: their annual 10x10x10 show as well as a cool installation by artist and composer Trimpin. Aside form the Mighty Tieton art shows we went in to visit, we didn’t see any people out. With nothing left to see we left after about half an hour and went back to Yakima where we were staying the night. What I liked about Mighty Tieton was their idea to utilize an underutilized resource, i.e. small American towns, to meet and fulfill the creative ideas of artists. They are working to help artists realize their entrepreneurial goals and also adding to and bolstering a small town’s local economy. The space is very cool. One show was in a refrigeration unit! It is reassuring to see that despite how far remote Tieton is, it is still attracting world class artists. So, in other words, size does not necessarily matter. There was also the fee of $5 per person on the tour. The fee is minimal, but it still annoyed me that they were charging anything at all for a tour. Moreover, what it feels like, however, is a longer distance form of gentrification. “Our story began with the idea that urban creative ambitions, which would be difficult to start or expand in the city, could take hold in Tieton.” It all feels like wealthy Americans experimenting in a small town. It seems to be working and it seems to be great for Tieton. And yet it just sort of feels like it’ll become the Bend of Washington – Manufactured paradise brought to you by the wealthy. My wife has super strong feelings about this, for sure. You’ll probably hear more about them if you haven’t already. The more we travel, we discover what is really important to us, and for us, what it means to be engaged community members. We really enjoy how artists can change the outlook on smaller towns by bolstering tourism and fostering community culture and art. In fact that is why we want to start a community arts organization centered around the things we love. While we love the many different forms this takes in the small towns of the world, we are still looking for good ideas and a great place to land. So glad! It has been a really fun project to keep this online journal…glad folks are enjoying it!